Best Chinese Knives: Brother 1502 Knife - Your Grandpa's Folder! 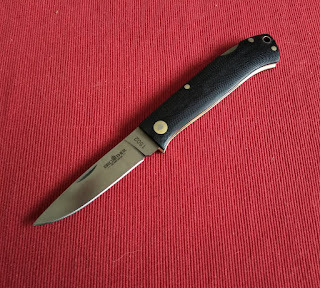 Brother 1502 Knife - Your Grandpa's Folder! So, this one arrived as well and it is time to make a short review of it. I actually won this knife in a GAW, so didn't order it myself. It arrived from China in less than 3 weeks (before the holidays). The Brother 1502 came in a plain cardboard box, pretty dirty inside (that is usually the case with Brother Knives, at least from my experience), blade was centered and sharp, no bladeplay. I cleaned it and it became very smooth (blade drops if you disengage the lock). - Great classic looks (is very similar to the now discontinued Kershaw Gentleman's folder). - Good fit and finish of the polished 3D G10 scales. - No bladeplay at all and the lock is pretty soft (for a lockback) and could be even used one-handed.- Became very smooth after cleaning. - Is thin and light (3.76 oz/106.8 g) for easy carry inside the pocket. - Has strong tip that won't break during EDC tasks + 440C stainless steel. - Nice ergos for my middle sized hand (because of the 3D scales). - Pinned constructon (couldn't be disassembled). - Sharpening wasn't even and pretty thick grind. - Cutting edge length is pretty short (2.75" with 3.14" blade). Full length is 7.25". - Small finish problems: lanyard hole isn't perfectly round and some scratches on the pivot pin. This is a classic Grandpa Knife (meaning similar to a knife our grandpas EDCed back in the day). IMO - this isn't a knife for knife aficionados and collectors, but more for actual use for non-knife people. The simple and strong construction make it virtually "dumbass proof" (couldn't be screwed up by dumbasses) so it will make an awesome loaner knife and a cool inexpensive gift for non-knife folks.